Yes, the bowls are very durable. Thanks to a centuries-old technique of making the product, high quality materials and a careful process of manufacturing, the basins are exceptionally durable. 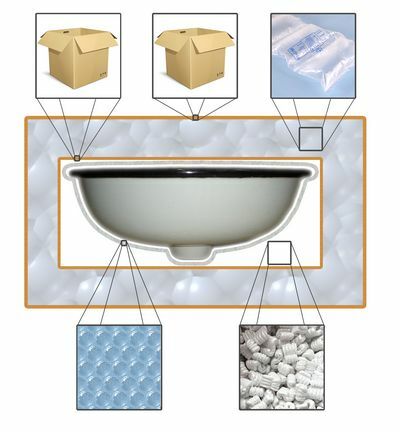 The quality of the bowls has been certified by a European Certificate of Safety (CE mark). The bowls have undergone laboratory tests for heat resistance, staining, abrasion and scratching. We would also like to inform you that the bowls are made from ceramics and as always with products made from such a material they might get damaged due to improper use. Yes, all the ceramic bowls in our shop (excluding Round Vessel Sinks) have got an overflow hole. 6. What does the process of producing Talavera type wash basins look like? The process of manufacturing Talavera bowls starts from mixing two kinds of clay. The mixture remains in water to soak, so that the quality of the clay improves and it is possible to shape it. After soaking the clay, the remaining water is drained, all impurities get removed and then the clay is kneaded with feet. Pieces of the clay are then placed in moulds (depending on the type of a bowl) and a bowl shaped in this way will dry for eight up to twelve weeks. The first burning of the clay takes place at a temperature of 850 degrees. Each bowl is covered with natural ceramic glaze, which imparts characteristic glow and colour to it. After putting on glaze, the bowls are hand painted with the use of paints prepared from mineral pigments. The bowls are then fired again, but this time at a temperature of 1050 Celsius degrees so that they obtain final durability and beauty. Our copper copper sinks and bathtubs are completed with a patina finish that is fired into the material, giving them an aged appearance. The key to maintaining copper sinks and bath tubs in perfect condition is all about avoiding scrubing and using abrasive materials that might damage the protective patina. 1. How to clean copper sinks and bathtubs? It is enough to use clean water with a delicate detergent for everyday cleaning of copper. However, if in the region where you live there is hard water, it is worth wiping the bowl with a smooth dry cloth from time to time. With a view to additional protection, you may wipe the bowl with furniture polish. Polishing the surface of the bowl regularly with furniture polish will help you to keep the sheen of the bowl and will allow for faster flow of water out of it (it helps to keep it free of mineral deposit). You will find more information on how to clean copper: here. 2. How to care for a Copper sinks and Bathtubs? 1. Apply a wax coating to your copper bathtub regularly, about once a month or so. The wax will lock in the brownish color of the tub. Beeswax is an acceptable wax to use. If your new copper bathtub already had a wax applied at the store or manufacturer, skip this step for now, but be sure to apply more wax when the initial wax wears off. 2. After bathing, dry your copper bathtub with a soft cloth. A polishing rag, like you'd use for car care, works well. A flannel cloth is also soft enough to get the job done. 3. Once a week or so, depending on need, wash out the copper bathtub. Use a gentle soap and a soft cloth to carefully scrub dirt and grime off. Steer clear of corrosive cleansers, such as ammonia and vinegar. 3. What should I beware of? While cleaning and using a copper basin, you should be cautious with any caustic substances, any substances containing chlorine or any substances which might damage the surface mechanically (e.g. scouring powders). If the colours on the surface of your bowl fade a little or change the tone, don't worry, because with time the faded places will take on a natural patina. You should be cautious with substances which might change the colour of the natural patina on copper, like: orange or lemon juice, ketchup, toothpaste, vinegar. Also, we do not recommend using sand or a scourer for cleaning copper bowls. 4. Is copper safe for your health? Copper is totally safe for your health. Additionally, copper has got natural antibacterial properties and is 'healthier' than most other metals used for producing wash basins. Scientific research has proved that bacteria may live on metal surfaces for many days, whereas on copper surfaces they can survive only a few hours. 5. What can be done with a patina? a) Copper ware may be cleaned with ammonia or vinegar mixed with salt (a handful of salt boiled with a glass of vinegar). Then rinse the surface with clean water, dry it and polish. b) At the chemist's you may buy oxalic (it has a form of white crystal grains). Pour oxalic into an adequate amount of water so that it becomes a saturated solution. With the use of a cloth, apply the solution onto the cleaned copper surface and after a few minutes rinse it with water. You may repeat the process until you get the required effect. The oxalic solution is not caustic and it reacts well with copper oxides. At the same time, it does not react with the metal itself. c) Grate a peeled potato or mix it finely. Put the mush onto the surface which you wish to clean and wait until it dries. After drying, remove the mush and wipe the surface with alcohol. 6. How are copper bowls manufactured? More detailed information: Process of manufacturing hand-hammered sinks made - video. We believe that our products will fulfill all the expectations of our customers. However, we are aware that in case of products so original and unique like ours, the decision whether to buy them or not may be difficult. Still, if you have made up your mind and bought our product, but on second thoughts you feel that it does not fulfill or suit your needs, there is an option of return or exchange for another one (at the same price). You may return the product within 5 working days from the day of the delivery. 2. Not pay any extra VAT (added tax based on the cost of the commodity, shipment and customs duty). The VAT is imposed at customs so the prices given by our competition (in case of a shipment from Mexico) do not include the hidden cost. All our prices include VAT.